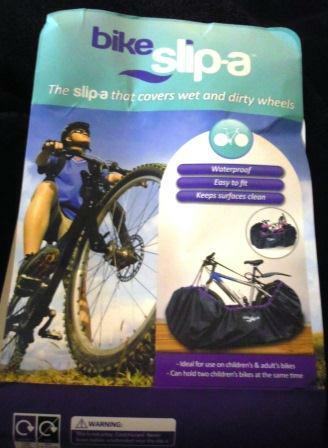 Bike Slip-a: The slip-a that covers wet and dirty wheels. 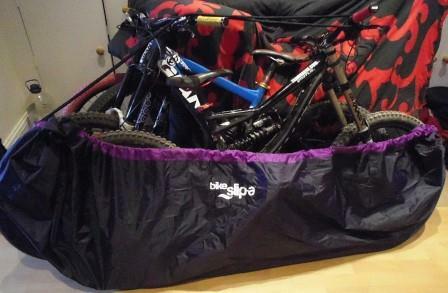 I first discovered slip-a products at this years London Bike Show in January. 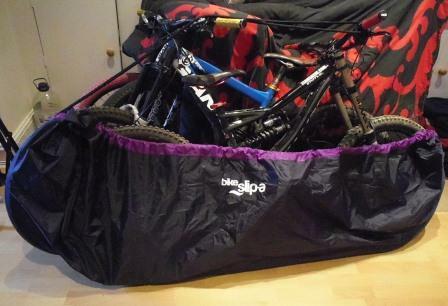 As someone who keeps bikes inside, and doesn’t want mud all over the house I thought this was a brilliant idea. 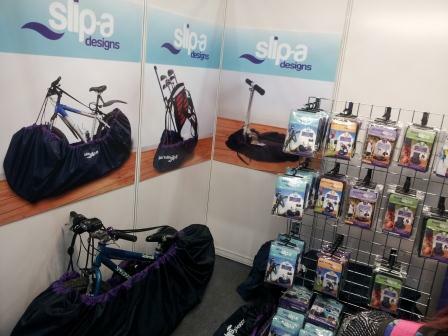 Slip-a designs also have a range of other products, visit their website for more information. After using the product for a few weeks during all the ‘lovely’ weather we’ve had I couldn’t have been more glad to have something to stop the mud dragging in through the front door and into the house. 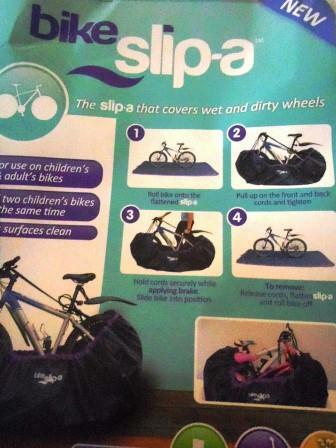 Unfortunately I am not always able to clean the bikes if there are no facilities near by, so they get greased up, and left, so this product is perfect. 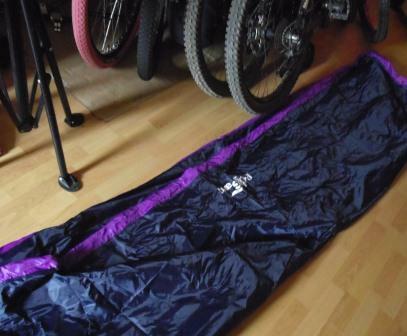 It’s made from a coated nylon material, rip stop nylon hem and has a polypropylene cord. 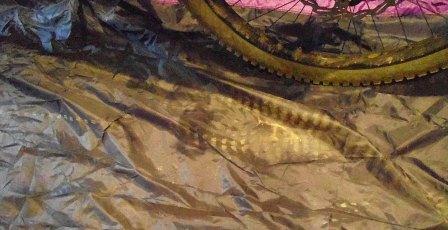 It’s designed to cover dirty wheels, not the whole bike. It’s simple to use, and after a few goes at using it with another person, I could use it by myself, it just takes some getting used to. Lay the Slip-a out flat. 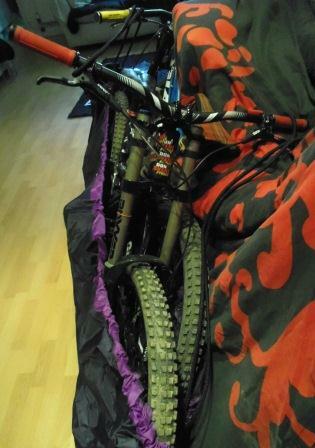 Roll the bike so it sits centrally. While holding the cord on the saddle reach for the front cord and pull tightly. 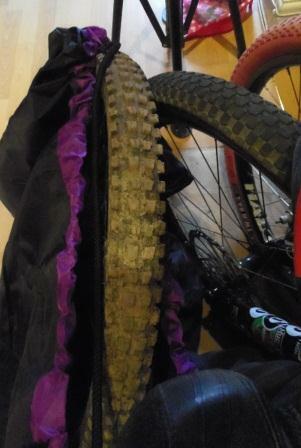 Make sure the Slip-a is over the wheels and pedals if there are any. Hold the brake and slide the bike where you want it. 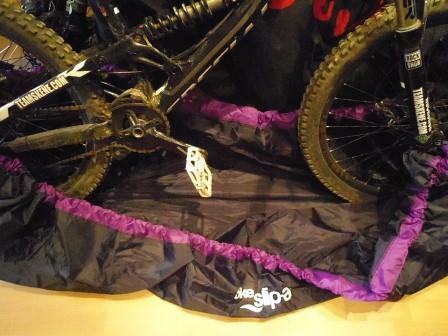 To remove the Slip-a slide the bike towards the outdoors and release the front cord. 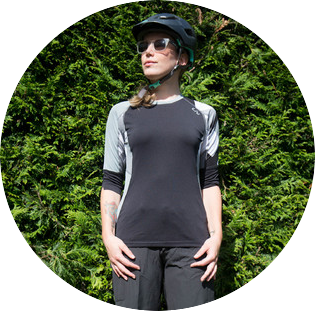 Release the back cord and push the Slip-a away from the wheel.Roll the bike off the Slip-a. If the Slip-a is wet or soiled. Shake it out and fold it in on itself and put away in the pouch. After quite a bit of use I’ve had no trouble with rips, and it’s easy to clean and store away if you don’t need to use it. 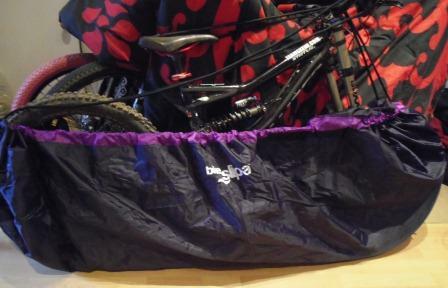 The instructions are clear and it really does save making a mess when storing bikes inside. 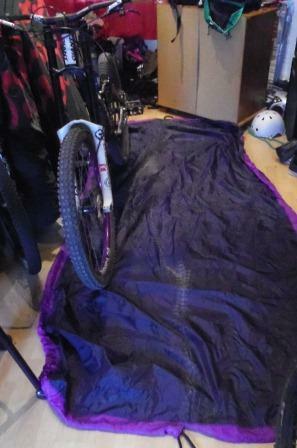 Having only used the product on wooden floors I can’t comment on how it is on other surfaces, but moving the bikes when holding the brakes on wooden floors is an easy process. I can imagine it won’t last as long on harder surfaces as you need to drag it. 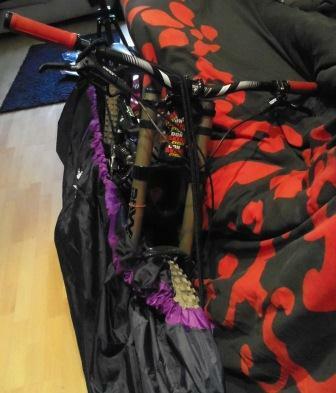 It is waterproof and catches mud from wheels and pedals to save getting mud in the house. See the gallery below for more images. These are available to buy from £34.95 via their website, just email Sales@slip-designs.co.uk for more details. 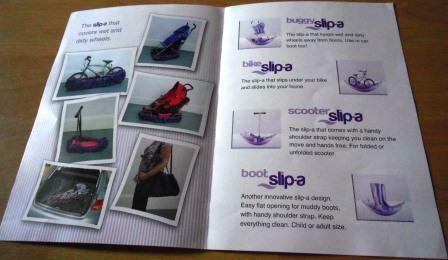 If you would be interested in stocking these products contact admin@slip-adesigns.co.uk. 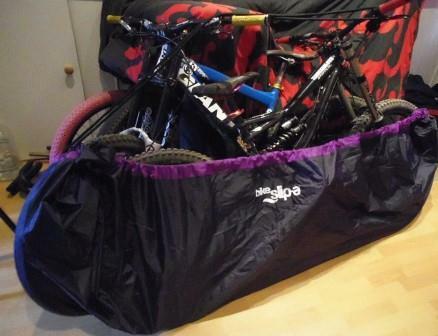 This product is perfect if you store your bike indoors and are fed up of the mess when you don’t have time to clean them. Easy to use and durable, they are worth every penny.